Now you can have a fun mug because this is a Harry Potter Charater Mug. 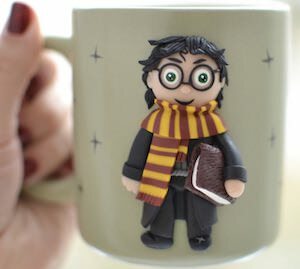 This is not a mug you will see in store as it is really special as it is a fun looking mug but what makes it better is that Harry Potter is stuck to the outside of the mug in his school outfit and he even brought a book for the next class. The mug can hold 11.5 oz of your favorite drink like tea, coffee or even water. If you are or know a Harry Potter fan that likes to stay hydraded then surprise them or your self with this special mug.